This hard-hitting blend delivers 29g of plant-based protein and 39g of carbs, giving a delicious shake with 400 calories per serving. With key ingredients specially chosen to help you achieve your fitness goals, it’s perfect for anyone struggling to gain mass with their normal diet. Packed with high-quality protein, it’ll help you hit your requirements to grow and maintain important muscle1 — vital for gaining size and strength. To help you achieve calorie surplus, which is key to bulking up, we’ve included a unique blend of organic flours — including amaranth, buckwheat and freekah — to stack up the carb content. Plus, we’ve added a unique blend of enzymes — DigeZyme® — to help you get the most from these macronutrients. 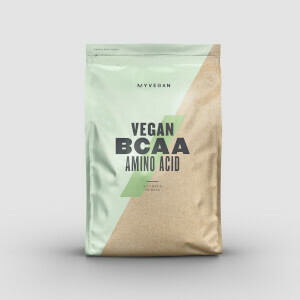 When to take Vegan Gainer Blend? This delicious shake is perfect to boost your protein and calorie intake, so enjoy between meals or pre- or post-workout. 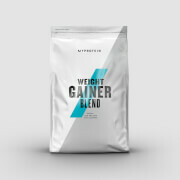 What does Vegan Gainer Blend work well with? For another helpful hit of calories, add our Organic Peanut Butter to your shakes — it’s naturally high in protein and a good source of healthy fats. Banana Cream Flavour: Fine Ground Oats (48%), Pea Protein Powder (22%), Non Dairy Vegetable Creamer (High Oleic Sunflower Oil, Thickener (Acacia Gum), Brown Rice Syrup, Anti-caking agent (Silicon Dioxide), Emulsifier (Sunflower Lecithin), D Alpha Tocopherols), Brown Rice protein (6%), Natural Flavouring (Natural Colour (Curcumin Extract), Sweetener(Sucralose)), Flax Seed Powder, Organic Amaranth flour, Organic Buckwheat Flour, Organic Freekeh Flour (Wheat), Thickeners ( Xanthan Gum, Guar Gum), DigeZyme® (Amylase, Lactase, Cellulase, Protease, Lipase). Chocolate Flavour: Fine Ground Oats (48%), Pea Protein Powder (20%), Non Dairy Vegetable Creamer (High Oleic Sunflower Oil, Thickener (Acacia Gum), Brown Rice Syrup, Anti-caking agent (Silicon Dioxide), Emulsifier (Sunflower Lecithin), D Alpha Tocopherols), Natural Flavouring ( Sweetener(Sucralose)), Brown Rice protein (6%), Flax Seed Powder, Organic Amaranth flour, Organic Buckwheat Flour, Organic Freekeh Flour (Wheat), Thickeners ( Xanthan Gum, Guar Gum), DigeZyme® (Amylase, Lactase, Cellulase, Protease, Lipase). Vanilla Raspberry Flavour: Fine Ground Oats (48%), Pea Protein Powder (21%), Non Dairy Vegetable Creamer (High Oleic Sunflower Oil, Thickener (Acacia Gum), Brown Rice Syrup, Anti-caking agent (Silicon Dioxide), Emulsifier (Sunflower Lecithin), D Alpha Tocopherols), Brown Rice protein (6%), Natural Flavouring(Sweetener(Sucralose)), Flax Seed Powder, Organic Amaranth flour, Organic Buckwheat Flour, Organic Freekeh Flour (Wheat), Thickeners ( Xanthan Gum, Guar Gum), DigeZyme® (Amylase, Lactase, Cellulase, Protease, Lipase). Unflavoured: Fine Ground Oats (51%), Pea Protein Powder (24%), Non Dairy Vegetable Creamer (High Oleic Sunflower Oil, Thickener (Acacia Gum), Brown Rice Syrup, Anti-caking agent (Silicon Dioxide), Emulsifier (Sunflower Lecithin), D Alpha Tocopherols), Brown Rice protein (7%), Flax Seed Powder, Organic Amaranth flour, Organic Buckwheat Flour, Organic Freekeh Flour (Wheat), Thickeners ( Xanthan Gum, Guar Gum), DigeZyme® (Amylase, Lactase, Cellulase, Protease, Lipase). Ready-to-mix carbohydrate and protein blend. Various flavours with sweeteners. Am a regular user of MP vegan products... tried this one and wished I hadn’t wasted my money. Vegan whole food is great, taste amazing and does what it says on the tin. This product however gives you the worst stomach aches and vilest wind ever. I have being using this product for about 5 months now as a healthy gainer. Now remove the Sucralose and you get a product that works and its worthy of 4.5/5 For mixing 3 large scoops in 400ml of water shake well, then add a tiny bit of water and shake again and its fine for me. I opt for the chocolate flavour and have no problems mixing or with the taste. Soya, water, almond milk (unsweetened), also combined with soya protein. Absolutely rank. Has a thick gritty texture and tastes like straw/a farm yard. Ordered two bags, I have requested a refund on the unopened one as it makes me feel physiclaly sick. I don't understand how people have said it tastes nice?! Only a wannabe vegan at the moment so will be sticking to whey for now. Look, I'm not vegan so I mix this with milk for maximum calories/protein and it tastes great. For people complaining about it not mixing; just put it in a bigger shaker and add more water/milk. And shake harder. It's not that difficult, if a 6 year old can make chocolate milk, You can make a protein shake. Bought this as I wanted to stop drinking whey and milk as I had a few digestion problems. I have to say I am surprised at how well this tastes, I would definitely recommend the chocolate flavour. It does not mix as well as other protein shakes, but this can be solved by just shaking it for a longer period or using a blender. I also noticed that there are not that many other vegan "weight gaining" shakes available on the market, so well done for MP for finally stocking a quality product. I would for sure recommend this to any vegan who struggles to put on weight. I mix 200g of this with water with a mixer and pour into my MyProtein 1/2 gallon hydrator; tastes absolutely fine and is a great way to consume extra calories without feeling full. Wouldn't recommend using a shaker for this as there would be too much powder and not enough water! I was a bit sceptical about trying because of some of the reviews. But i think it tastes great. I do 2 scoops in the my protein shaker cup and have had no problems with mixing. The taste is also quite nice. I got a flavoured one which was okay but too sweet for me (raspberry). Next one I'm going to get plain. It's way too thick to use three scoops as they say even with a blender. So you don't get the same amount as they say, as the scoops need to be smaller. But nonetheless does the job! Coconut water and fruits blended. Just taste like a smoothie! Been waiting for MP to release something like this for well over 10 years. Finally we have a vegan weight gainer. Mixes well i thought despite what others have said (ive used other brands that didnt mix half as well as this). Just make sure you use enough water (i use about 550ml and 2 scoops). As for the taste, well i thought it tasted really good. Definitely palatable which is half the battle surely at times :-) Would recommend!